Bob and I were married in Chicago, October 15, 1955. His best friend was marrying my best friend. We were both out of college. He was out of the Marine Corps. Family life was pretty normal. He was diagnosed with Parkinson’s in 2005. At first it was nothing, he had a little tremor in his left hand, and it progressed very slowly. Bob worked for NBC for 27 years. He was made for it. His personality—he was not afraid to make decisions, he could stand behind them. We didn’t realize it, but he was losing his grip on everything that he was doing. We started to see that my dad was very overwhelmed by it all. I think financially, he didn’t understand his accounts anymore. Back in 2011, I could see that my father-in-law was starting to really struggle with his Parkinson’s. Sit in on family meetings, and we started to plan together with Wells Fargo’s help. We realized that as a family, you really have to look to the future; and not only just grandchildren, but even beyond that. 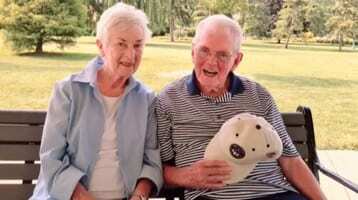 In Life Management Services, we help work with individuals and their families through the aging process. We manage finances; we help getting access to the appropriate health care. My role with clients is to really try to assist them with tasks that they no longer wish to do themselves, or no longer can for certain reasons. I think that many of the things the Wells Fargo team does, I would probably be doing. Now, I can be a little bit more involved in other things. I’m there a lot, but I don’t have to worry about them. Allison works with Margy and with me. She also takes over bills and the things I’ve paid. We meet with Margy and Randy so they know what’s going on, go over the goals, the things we’re trying to accomplish. It’s been tremendously helpful to us as a family. I’ve really been impressed with the Life Management Services at Wells Fargo. They’ve really helped my mother-in-law and father-in-law a lot. Those services have been very important to us. Learn more about Wells Fargo Life Management Services. As of November 12, 2016, Wells Fargo Advisors is a trade name used by Wells Fargo Clearing Services, LLC. Historical videos may not reflect this update to the broker-dealer name.